A proportional counter, also known as the proportional detector, is an electrical device that detects various types of ionizing radiation. The voltage of detector is adjusted so that the conditions correspond to the proportional region. In this region, the voltage is high enough to provide the primary electrons with sufficient acceleration and energy so that they can ionize additional atoms of the medium. These secondary ions (gas amplification) formed are also accelerated causing an effect known as Townsend avalanches, which creates a single large electrical pulse. 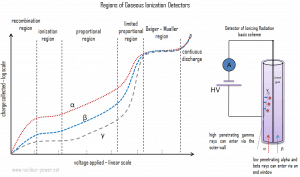 Gaseous proportional counters usually operate in high electric fields of the order of 10 kV/cm and achieve typical amplification factors of about 105. 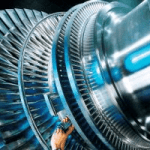 Since the amplification factor is strongly dependent on the applied voltage, the charge collected (output signal) is also dependent on the applied voltage and proportional counters require constant voltage. This is a subtle, but important difference between ionization chambers and proportional counters. An ionization chamber will produce a current that is proportional to the number of electrons collected each second. This current is averaged and is used to drive a display reading in Bq, or μSv/h. Proportional counters do not work in this way. Instead, they amplify each of the individual bursts of ionisation so that each ionising event is detected separately. They therefore measure the number of ionising events (which is why they are called counters). The process of charge amplification greatly improves the signal-to-noise ratio of the detector and reduces the subsequent electronic amplification required. When instruments are operated in the proportional region, the voltage must be kept constant. If a voltage remains constant the gas amplification factor also does not change. Proportional counter detection instruments are very sensitive to low levels of radiation. By proper functional arrangements, modifications, and biasing, the proportional counter can be used to detect alpha, beta, gamma, or neutron radiation in mixed radiation fields. Moreover, proportional counters are capable of particle identification and energy measurement (spectroscopy). The pulse height reflects the energy deposited by the incident radiation in the detector gas. As such, it is possible to distinguish the larger pulses produced by alpha particles from the smaller pulses produced by beta particles or gamma rays. While ionization chambers can be operated in current or pulse mode, proportional counters or Geiger counters are almost always used in pulse mode. Detectors of ionizing radiation can be used both for activity measurements as well as for dose measurement. With knowledge about the energy needed to form an pair of ions – the dose can be obtained. Argon and helium are the most frequently used fill gases and allow for the detection of alpha, beta, and gamma radiation. For neutron detection He-3 and BF3 (Boron Trifluoride) are the most commonly employed gases. For special purposes other mixtures of gases have been used, such as a tissue equivalent gas mixture consisting of 64.4% methane, 32.4% carbon dioxide and 3.2% nitrogen. In the proportional region, the charge collected increases with a further increase in the detector voltage, while the number of primary ion-pairs remains unchanged. Increasing the voltage, provides the primary electrons with sufficient acceleration and energy so that they can ionize additional atoms of the medium. These secondary ions formed are also accelerated causing an effect known as Townsend avalanches, which creates a single large electrical pulse. Even though there is a large number of secondary ions (about 103 – 105) for each primary event, the chamber is always operated such that the number of secondary ions is proportional to the number of primary events. It is very important, because the primary ionization is dependent on the type and energy of the particles or rays in the intercepted radiation field. The number of ion pairs collected divided by the number of ion pairs produced by the primary ionization provides the gas amplification factor (denoted by A). The gas amplification that occurs in this region can increase the total amount of ionization to a measurable value. The process of charge amplification greatly improves the signal-to-noise ratio of the detector and reduces the subsequent electronic amplification required. When instruments are operated in the proportional region, the voltage must be kept constant. If a voltage remains constant the gas amplification factor also does not change. Proportional counter detection instruments are very sensitive to low levels of radiation. Moreover, proportional counters are capable of particle identification and energy measurement (spectroscopy). 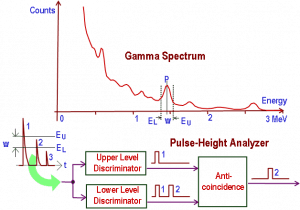 Different energies of radiation and different types of radiation can be distinguished by analyzing the pulse height, since they significantly differ in the primary ionization. This diagram shows the number of ion pairs generated in the gas-filled detector, which varies according to the applied voltage for constant incident radiation. 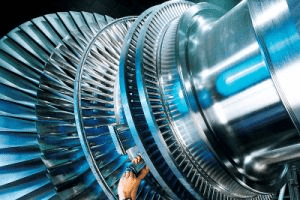 The voltages can vary widely depending upon the detector geometry and the gas type and pressure. This figure schematically indicates the different voltage regions for alpha, beta and gamma rays. There are six main practical operating regions, where three (ionization, proportional and Geiger-Mueller region) are useful to detect ionizing radiation. 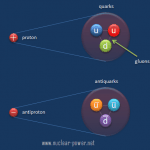 Alpha particles are more ionising than beta particles and than gamma rays, so more current is produced in the ion chamber region by alpha than beta and gamma, but the particles cannot be differentiated. More current is produced in the proportional counting region by alpha particles than beta, but by the nature of proportional counting it is possible to differentiate alpha, beta and gamma pulses. In the Geiger region, there is no differentiation of alpha and beta as any single ionisation event in the gas results in the same current output. 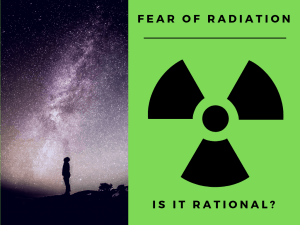 Detectors of ionizing radiation consist of two parts that are usually connected. The first part consists of a sensitive material, consisting of a compound that experiences changes when exposed to radiation. The other component is a device that converts these changes into measurable signals. The proportional counter has a cathode and an anode that are held at some voltage (above 1000 V), and the device is characterized by a capacitance that is determined by the geometry of the electrodes. In a proportional counter the fill gas of the chamber is an inert gas which is ionized by incident radiation, and a quench gas to ensure each pulse discharge terminates; a common mixture is 90% argon, 10% methane, known as P-10. As ionizing radiation enters the gas between the electrodes, a finite number of ion-pairs are formed. In air, the average energy needed to produce an ion is about 34 eV, therefore a 1 MeV radiation completely absorbed in the detector produces about 3 x 104 pair of ions. The behavior of the resultant ion-pairs is affected by the potential gradient of the electric field within the gas and the type and pressure of the fill gas. Under the influence of the electric field, the positive ions will move toward the negatively charged electrode (outer cylinder), and the negative ions (electrons) will migrate toward the positive electrode (central wire). The electric field in this region keeps the ions from recombining with the electrons. In the immediate vicinity of the anode wire, the field strength becomes large enough to produce Townsend avalanches. 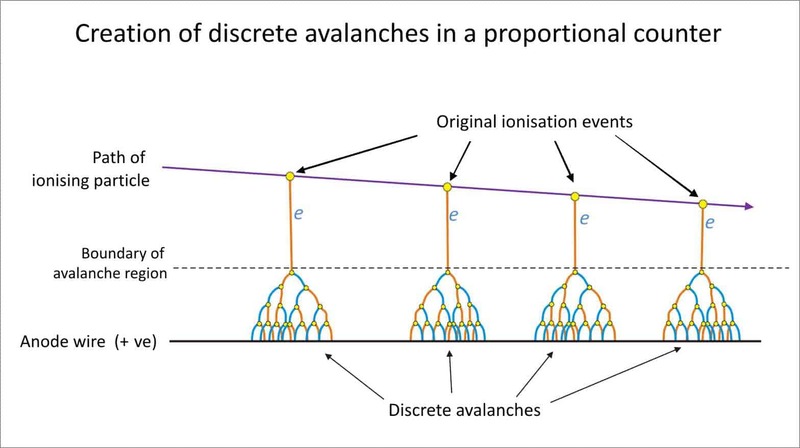 This avalanche region occurs only fractions of a millimeter from the anode wire, which itself is of a very small diameter. The purpose of this is to use the multiplication effect of the avalanche produced by each ion pair. This is the “avalanche” region. A key design goal is that each original ionizing event due to incident radiation produces only one avalanche. Gas amplification factors can range from unity in the ionization region to 103 or 104 in the proportional region. The high amplification factor of the proportional counter is the major advantage over the ionization chamber. The collection of all these electrons will produce a charge on the electrodes and an electrical pulse across the detection circuit. Each pulse corresponds to one gamma ray or particle interaction. The pulse height is proportional to the number of original electrons produced. But in this case the pulse height is significantly amplified by the detector. The proportionality factor in this case is the gas amplification factor. The number of electrons produced is proportional to the energy of the incident particle. Therefore, proportional counters are capable of particle identification and energy measurement (spectroscopy). Different energies of radiation and different types of radiation can be distinguished by analyzing the pulse height, since they significantly differ in the primary ionization (low-LET vs high-LET). Since the process of charge amplification greatly improves the signal-to-noise ratio of the detector, the subsequent electronic amplification is usually not required. Ionization chamber construction differs from the proportional counter. The flat plate design is preferred for ionization chambers, or concentric cylinders may be utilized in the construction to allow for the integration of pulses produced by the incident radiation. 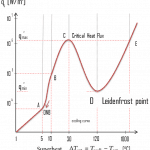 Proportional counters and Geiger counters usually utilize cylinder and central electrode. The proportional counter would require such exact control of the electric field between the electrodes that it would not be practical. In a proportional counter the fill gas of the chamber is an inert gas which is ionized by incident radiation, and a quench gas to ensure each pulse discharge terminates; a common mixture is 90% argon, 10% methane, known as P-10. 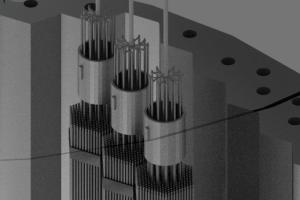 For each electron collected in the chamber, there is a positively charged gas ion left over. These gas ions are heavy compared to an electron and move much more slowly. Free electrons are much lighter than the positive ions, thus, they are drawn toward the positive central electrode much faster than the positive ions are drawn to the chamber wall. The resulting cloud of positive ions near the electrode leads to distortions in gas multiplication. Eventually the positive ions move away from the positively charged central wire to the negatively charged wall and are neutralized by gaining an electron. In the process, some energy is given off, which causes additional ionization of the gas atoms. The electrons produced by this ionization move toward the central wire and are multiplied en route. This pulse of charge is unrelated to the radiation to be detected and can set off a series of pulses. In practice the termination of the avalanche is improved by the use of “quenching” techniques. The quenching gas molecules have a weaker affinity for electrons than the chamber gas does; therefore, the ionized atoms of the chamber gas readily take electrons from the quenching gas molecules. Thus, the ionized molecules of quenching gas reach the chamber wall instead of the chamber gas. The ionized molecules of the quenching gas are neutralized by gaining an electron, and the energy liberated does not cause further ionization, but causes dissociation of the molecule. Special Reference: U.S. Department of Energy, Instrumantation and Control. DOE Fundamentals Handbook, Volume 2 of 2. June 1992. Proportional counters in the form of large area planar detectors are used extensively to check for radioactive contamination on personnel, flat surfaces, tools, and items of clothing. Proportional counters are normally used to detect alpha and beta particles, and can enable discrimination between them by providing a pulse output proportional to the energy deposited in the chamber by each particle. They have a high efficiency for beta, but lower for alpha. For alpha and beta particles to be detected by proportional counters, they must be provided with a thin window. This “end-window” must be thin enough for the alpha and beta particles to penetrate. However, a window of almost any thickness will prevent an alpha particle from entering the chamber. The window is usually made of mica with a density of about 1.5 – 2.0 mg/cm2 to allow low-energy beta particles (e.g. from carbon-14) to enter the detector. The efficiency reduction for alpha is due to the attenuation effect of the end window, though distance from the surface being checked also has a significant effect, and ideally a source of alpha radiation should be less than 10mm from the detector due to attenuation in air. Gamma rays have very little trouble in penetrating the metal walls of the chamber. 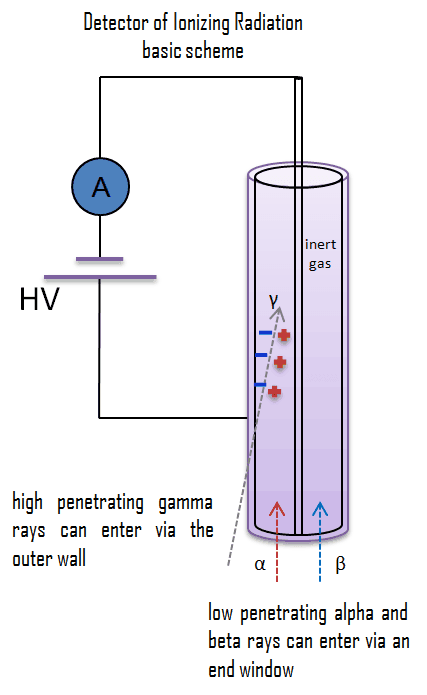 Therefore, proportional counters may be used to detect gamma radiation and X-rays (thin-walled tubes) collectively known as photons, and for this the windowless tube is used. The main drawback to using proportional counters in portable instruments is that they require a very stable power supply and amplifier to ensure constant operating conditions (in the middle of the proportional region). This is difficult to provide in a portable instrument, and that is why proportional counters tend to be used more in fixed or lab instruments. In general, spectroscopes are devices designed to measure the spectral power distribution of a source. The incident radiation generates a signal that allows to determine the energy of the incident particle. In proportional counters, the number of electrons produced is proportional to the energy and type of the incident particle. Therefore, proportional counters are capable of particle identification and energy measurement (spectroscopy). Different energies of radiation and different types of radiation can be distinguished by analyzing the pulse height, since they significantly differ in the primary ionization (low-LET vs high-LET). Proportional counters may be used for example to analyse a spectrum of alpha radiations or a spectrum of beta particles. 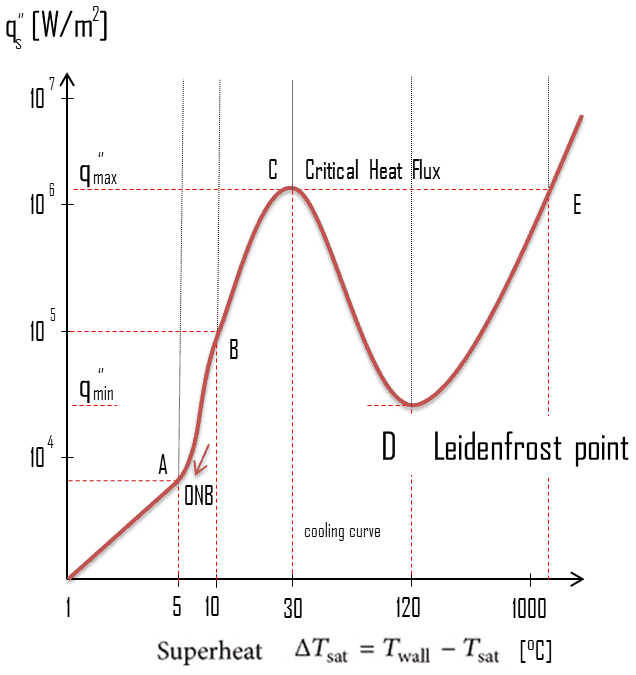 The energy resolution of a proportional counter, however, is limited because both the initial ionization event and the subsequent ‘multiplication’ event are subject to statistical fluctuations characterized by a standard deviation equal to the square root of the average number formed. A large volume spherical proportional counter can be used for neutron measurements. The pure N2 gas is studied for thermal and fast neutron detection, providing a new way for neutron spectroscopy. The neutrons are detected via the 14N(n,p)14C and 14N(n,α)11B reactions. It must be noted, for gamma spectrometry, the most common detectors include sodium iodide (NaI) scintillation counters and high-purity germanium detectors. A multi-wire proportional chamber is a type of proportional counter used especially in high energy particle physics to detect charged particles and photons and can give positional information on their trajectory. This device was developed by Georges Charpak and his collaborators. This invention resulted in him winning the Nobel Prize for Physics in 1992. 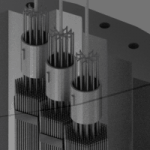 The multi-wire chamber uses an array of wires at high voltage (anode), which run through a chamber with conductive walls held at ground potential (cathode). The principle is to have a plane of anode wires positioned precisely, with typical wire-spacings of about 2 mm. By computing pulses from all the wires, the particle trajectory can be found. 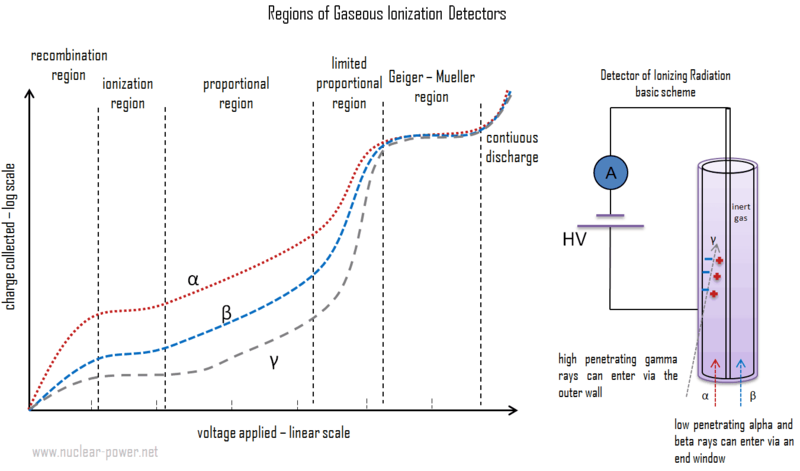 Proportional counters are often used as the charged particle detection device. In nuclear power plants, gas-filled (BF3) proportional counters are normally used as source range detectors. These detectors use the gas boron trifluoride (BF3) instead of air in the chamber. The incoming neutrons produce alpha particles when they react with the boron atoms in the detector gas. Most of (n,alpha) reactions of thermal neutrons are 10B(n,alpha)7Li reactions accompanied by 0.48 MeV gamma emission. Proportional counter output is in the form of one pulse for every ionizing event; therefore, there is a series of random pulses varying in magnitude representing neutron and gamma ionizing events. The pulse height may only be a few millivolts, which is too low to be directly used without amplification. The discriminator excludes passage of pulses that are less than a predetermined level. 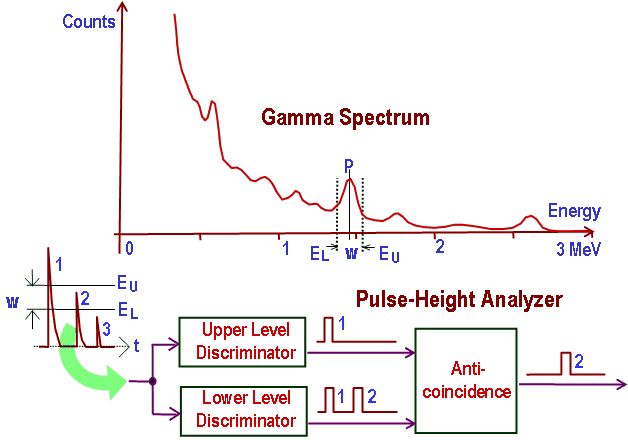 The function of the discriminator is to exclude noise and gamma pulses that are lower in magnitude than neutron pulses.